Obverse: On the left side of the banknote are imperial regalia: Coat of Arms of the Russian Empire, 1857 - Imperial Double-Headed Eagle and Imperial Crown of Russia above monogram of Czar Alexander II of Russia and the Badge of the Imperial Order of St. Andrew the Apostle the First-Called. On the right side depicted the face value in arabic numerals "50". On the obverse is the text: «Государственный кредитный билет. По предъявлении выдается из разменной кассы Государственного Банка ПЯТЬДЕСЯТЬ РУБЛЕЙ серебряною или золотою монетою». (State Credit Note. Payable to the bearer of this Note from the currency exchange offices of the State Bank the FIFTY RUBLES in silver or gold coins). Signatures of the Governor of State Bank - Evgenij Ivanovich Lamansky and one of the cashiers. Reverse: Portrait of Peter The Great, also known as Peter I (1672 – 1725) was the Tsar of Russia between 1682 and 1725. Beginning with a Tsardom, he ended with an Empire (following his many conquests). Around the portrait is written the inscriptions of full name and titles of the Tsar: "ПЕТРЪ ВЕЛИКIЙ ИМПЕРАТОРЪ И САМОЖЕРЖЕЦЪ ВСЕРОССIЙСКIЙ". 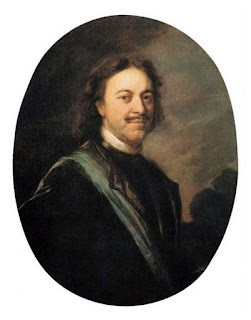 (Peter the Great, Emperor and Autocrat of all Russia). Two small guilloche rosettes with the face value "50" at left and right and date of issue at upper center. Text: "Extract from the Highest Manifesto of 1 June 1843, relating to the issue of state credit notes". Watermark: The face value in arabic numerals "50" at upper corners, in the lower corners the words "РУБ" (RUBLES), abbreviation «Г. 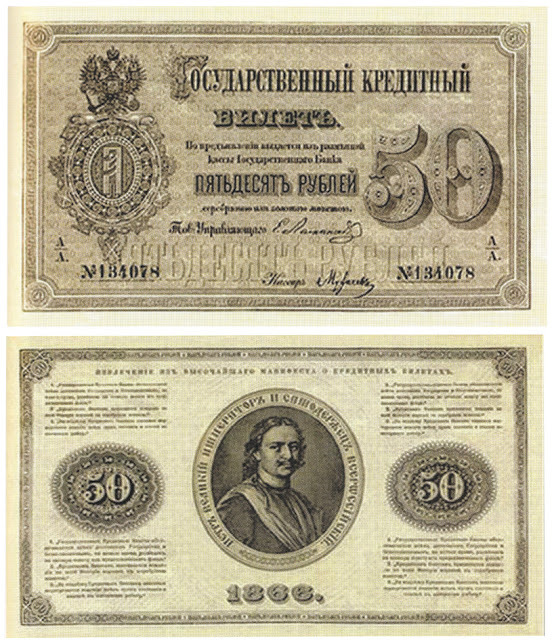 К. Б.» (Государственный Кредитный Билет - State Credit Note) on the top, the date of issue at lower center. Date of issue: 15 October 1869, according to the decree of 14 October 1868 (No. 46363). Withdrawn from circulation: This notes was exchanged for the new banknotes of 1887 issue, according to the decree of November 13, 1892 (No. 9037) until May 1, 1894. Not Payable from 1 May 1894. Size: 175 × 105 mm.